When most people think about chihuahuas, they think about their tiny frames but large, dominant personalities. Indeed, most chihuahuas have a Napoleon complex, as many bite, growl and try to control anything in their path--no matter how large. However, your chihuahua puppy does not have to be this way. When properly trained, many chihuahua puppies turn into loving, respectful adults. If this type of temperament is what you desire, create it with persistent and patient training. Show your chihuahua puppy that you are leader of the pack, not it. Most chihuahua puppies walk into new homes with the assumption that they are in charge, and unless you show it otherwise, it will try to control you and the entire household. Make your puppy wait for your permission to eat and always rub your hands on the food so that your scent is on there. In addition, hold your chihuahua puppy in your arms like a baby with its belly facing upwards a few times a day. This position puts your chihuahua in a vulnerable place and literally shows it that you are on top. Correct any bad behavior immediately. Biting, growling or any other dominant, aggressive actions that chihuahuas tend to display should never be allowed. Say "no" in a deep, stern voice and place the chihuahua puppy in the baby holding position for a few minutes. Do not use the puppy's name when saying "no," but be consistent in your tone and voice level. Puppies do not understand words and go by the sound of what you are saying. Place your chihuahua puppy in a crate when you cannot provide supervision. Crate training will assist in house-training and will also keep the puppy out of danger when you are away. Chihuahuas are tiny and should be kept in small crates that only allow enough room for it to stand up, turn around and lie down. Take you chihuahua puppy outside to potty at the same times every day. This will help the puppy to know when it can "go" and how long it has to "hold it" until then. Go outside through the same door to the same area each and every time. Consistency is key in potty-training and any sort of variation can impede success. Give your chihuahua puppy treats and praise when it does what you ask. Chihuahua puppies are intelligent creatures who respond well to positive association and rewards. Your chihuahua puppy will soon learn that when it obeys, it receives a tasty treat and will likely start doing whatever it can to earn that reward again. 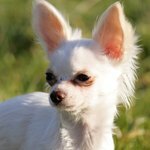 What Are the Symptoms of Kidney Failure in the Chihuahua Breed of Dog?